1.2 Between "Baby" and "Safe"
Level Preface: Do not under any circumstances learn to grab midpoint parrot, it is bad! There can be a couple of frustrating things when learning this level; the most frustrating being the Diddy headbutt (seen at 0:51). 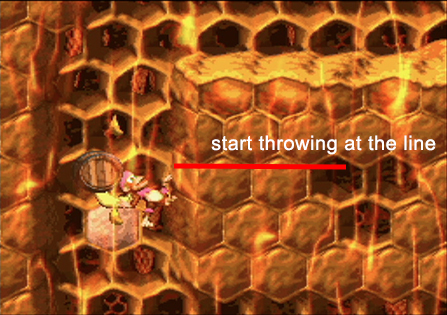 Occasionally during this hit, Diddy will not launch himself into the crack inbetween the bee, causing you to lose invincibility frames and the ability to keep falling down without dying to the bees (See Backups section if you missed the headbutt). 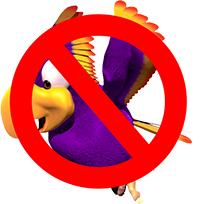 This is for those who don't need the use of Mid Point Parrot (as shown on Baby strats), but also aren't confident in doing the Jump Buffer strats. Is a tad bit slower, but for beginners should be the recommend strats to start. If you roll into the beetle one frame after the DK barrel breaks you'll skip the freeze animation when you get a Kong. This is due to the fact that you have one frame of movement after the DK barrel breaks, and if you begin rolling through an enemy during this frame, then you can cancel the freeze. This set-up only works if you're using Dixie. You want to grab the barrel and hug the wall on the right as you're falling. Start throwing in the middle of the wall or you can use the second banana as a visual (see image above). As soon as you land immediately roll into the beetles. This set-up has potential to fail if you throw too high or too low, and the throw does not need to be perfect but close to it. 0:04 Performing a small jump here saves 3 frames if done optimally. Most of the time, though, it will probably break even with the normal strat. At 0:19, make sure to hold Y while falling to be able to maneuver around all the bees. A good way to avoid the midpoint parrot is to mash the Y button, then hold it before you start rolling. Mashing will buffer the roll. At 0:32, do not damage through the bee. Instead, go down an extra level, roll off the platform then quickly tap right so that Dixie is stuck against the wall and finally jump into a headbutt. This allows more continuous dropping (Saves ~3s, or 2.5s if you get the 1 Frame Barrel (see above)). If you get hit after the roll off part, you can often navigate down to the DK barrel with invincibility frames. At 0:45, drop right instead of left, allowing you to fall in one smooth motion (Saves ~.25s). Minimize time spent gliding as Dixie. Note: The bee around where 'G' is actually isn't as low as the picture shows. You'll want to start holding right after you pass that bee. Riz 1d can be used as a backup if you roll for too long and hit the left wall, or simply as an alternative strategy.